You're probably very familiar with all of the road signs you see during your daily commute. But you might be surprised to learn how they're made — and how big they are. Find out more. See video. HANOVER, Md. — You’re probably very familiar with all of the road signs you see during your daily commute. But you might be surprised to learn how they’re made — and how big they are. 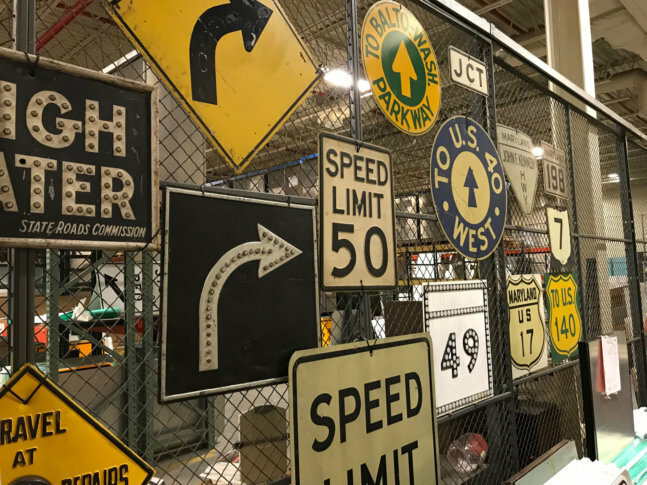 Steven Hall, manager of the Maryland State Highway Administration’s sign shop, says visitors are particularly blown away by those big green highway signs. “They think, ‘Oh, well they don’t look that big,’ until you see one inside this building and you stand next to it. It’s like, ‘Wow, it’s really that big? '”, said Hall during a behind-the-scenes tour of the shop near BWI Marshall Airport. The highway signs made there — known as guide signs — range in size from about 8 feet high and 10 feet wide, to 12 feet tall and 30 feet wide and wider. Hall says the biggest sign they made in recent years is 12 feet high and 50 feet wide, and it hangs above I-270 near the Capital Beltway. And several of the smaller signs the shop makes are actually getting a size boost for safety. “Some of our signs are going to a larger size for readability, to help motorists. (For instance) our one way signs used to be 12″x 36″, now they’re going to 18″x 54″,” said Hall. Most of the signs the shop makes are screen printed, like t-shirts. “Speed limits, keep-rights, do-not-enter, stop signs, stuff like that, we will silk those because we can run hundreds within a couple hours,” Hall said. Other signs, including green highway signs, are made by pressing super-tough stickers called reflective sign sheeting onto pieces of aluminum. The sticky material is made by 3M and designed to stay stuck through all kinds of weather for at least 15 to 20 years. Hall says the signs are more likely to fade from exposure to sunlight or be knocked over before the sheeting comes unstuck. Computers and plotters are used to design and cut out the material used to make signs that are not screen printed. In the past, the shop would attach metal letters and numbers to the aluminum, and each one would have to be riveted on. Another thing about today’s signs that you might not be aware of: Depending on their purpose, different signs are made to have different levels of brightness when light shines on them. “All the red series is done in a Diamond Grade, which is the brightest. Because those are the signs you really need to draw attention to. It’s the stops, wrong-ways, do-not-enters, the stuff like that. They’re the brightest material along with our guide signs, because guide signs have to get you somewhere,” said Hall. The shop has a display of vintage, no-longer-used road signs, including some made out of wood instead of metal. The shop has just five employees, but they’ve churned out about 11,000 signs per year over the last two years. That’s around 80,000 square feet of signs every year. In addition to the State Highway Administration, the shop supplies the signs for other state agencies such as the Maryland Transportation Authority and the Maryland Department of Transportation, as well as contractors. Hall has been in the business of sign operations for 35 years, and when he’s out and about, he can’t help but look closely at the signs he passes.